Journalism and PR have changed over the past several years. The old way of pitching journalists via email or even snail mail is slowly being replaced by social media. 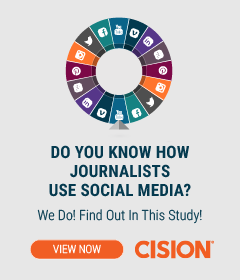 As the latest edition of Cision’s annual Global Social Journalism Study shows, journalists are using social media not only for publishing and promoting their content, but also interacting with audiences. In fact, most journalists said they feel they are more engaged with their audiences because of social media. If you haven’t been connecting with journalists on Facebook, Twitter and the rest, the time is now. This year’s report reveals that, more than ever, journalists are open to connecting with PR sources via social media. Here are 5 tips to help you be that source. This is a good practice in general, but it could cozy you up closer to the reporters you want to pitch. Whenever you share a journalist’s article, make sure to tag her with her social media username so you can get on her radar. Journalists are communicators by nature, and the fact that 58 percent find value in interacting with their audience on social media is testament to that fact. Forget pitching just yet; instead, start a dialogue around an article you really enjoyed. Ask a question. Yes, it’s ego-stroking, but it works. Don’t put all your social eggs into one basket, because 68 percent of journalists use at least three different types of social media. You may have to do a little digging to find out where your targeted journalists are spending time, but it’s worth the effort. Oh and just a tip: Twitter is by far journalists’ favorite spot for hanging out. And you might be surprised: they’re also using Snapchat! Not to be ageist, but how old a journalist is will definitely guide you to understand the channels they use to source content. Younger journalists — 62 percent of them, anyway — prefer audio-visual sharing platforms like YouTube, whereas older journalists turn to professional networks like LinkedIn. Despite social media having an unprecedented place of honor in a journalist’s world, email is still the preferred form of contact for journalists. Again, it depends on the age group. If you don’t see a lot of social activity for a journalist you’re targeting, try emailing your pitch. Or just ask. If you tweet “are you open to pitches via social media?” the journalist will let you know if she is. The fact is: social media isn’t leaving the PR pitch equation any time soon. Start paying attention to journalists on social networks and rope it into your pitch strategy to connect to social-savvy media contacts. 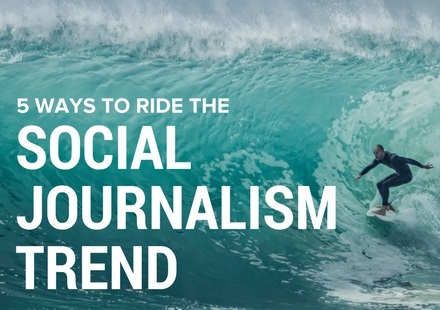 Uncover more social media trends with Cision’s 2016 Global Social Journalism Study. Download it now for an in-depth look at journalists’ perspectives on social media across the United States, Canada, Finland, Germany, France, Sweden and the United Kingdom, and how their understanding and usage of it has evolved.